Upgrade to Octa Core 32GB+4GB? 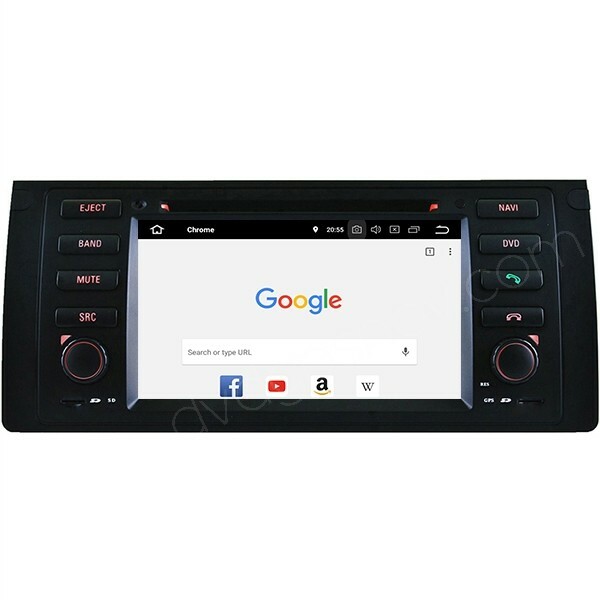 This aftermarket navigation Android head unit fits perfectly BMW X5 E53 1999, 2000, 2001, 2002, 2003, 2004, 2005 and 2006 year, supporting steering wheel controls and back up camera video displaying, a USB Apple carplay device optional. FREE Gifts: 8GB SD card with GPS maps available worldwide! As low as US$299 now. 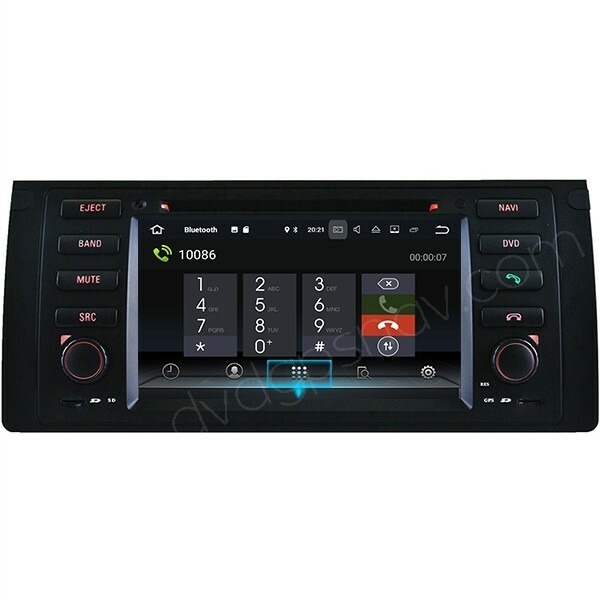 This aftermarket navigation Android radio head unit is custom made for BMW X5 E53 1999, 2000, 2001, 2002, 2003, 2004, 2005 and 2006 year, supporting steering wheel controls and back up camera video displaying, supporting Bluetooth hands free phone calling function for both Android phones and iPhone, supporting 1080p HD videos, with Android navigation system supporting 2D/3D HD maps. 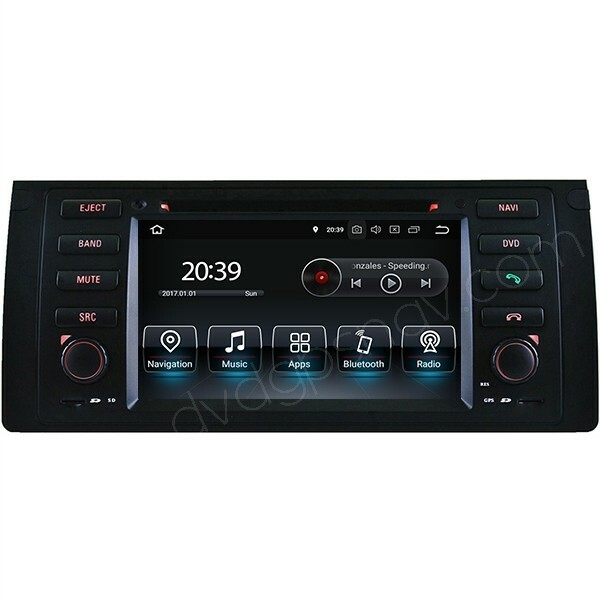 Besides, this BMW X5 E53 Android radio can also fits BMW 5 series E39, because they are with the same dashboard and wiring harness. 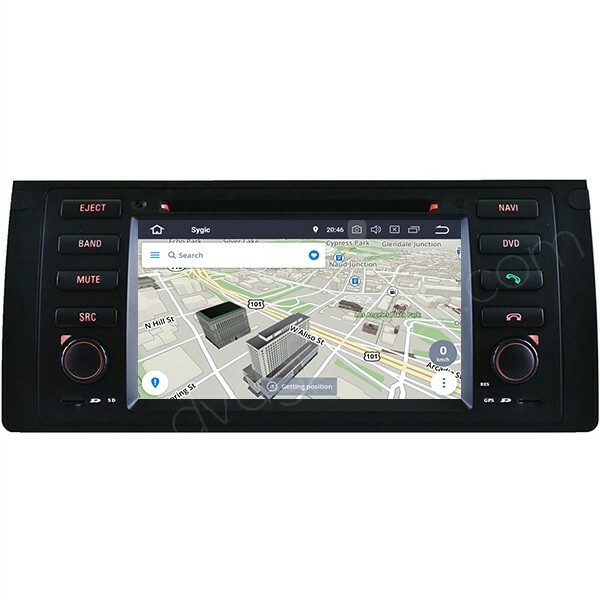 Latest Version: This BMW X5 E53 Android radio navigation has been upgraded with Android 8.0 system now. 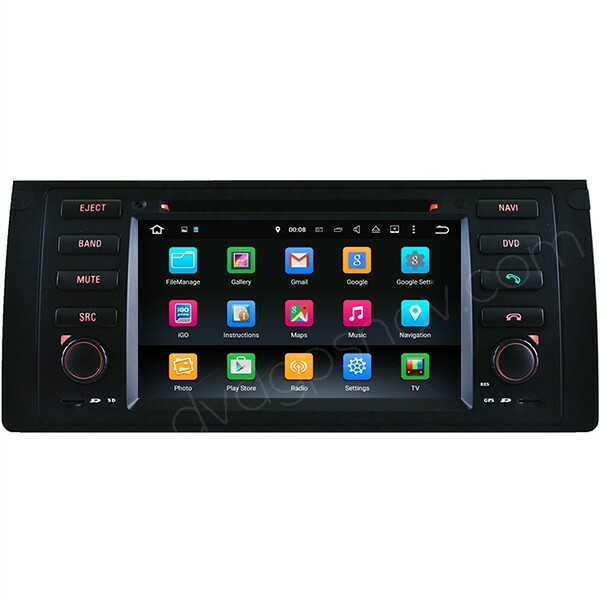 Why buy BMW X5 E53 Android Radio Head Unit From Us? 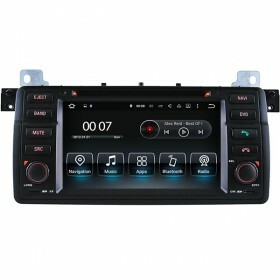 We offer the best quality Android radio for BMW X5 E53, including the external plastic frame and internal hardware. 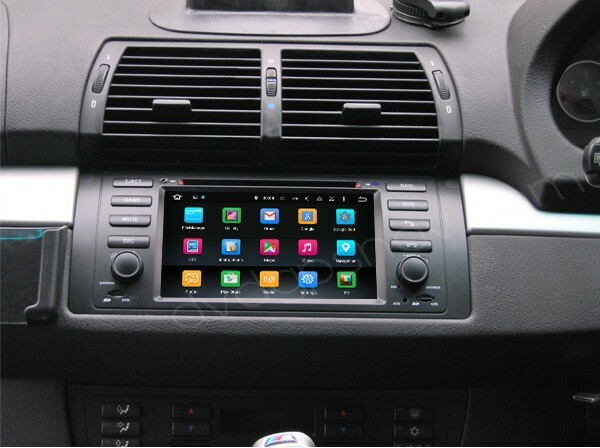 We're the first manucturer of aftermarket BMW X5 E53 Android radio supplier since 2009. Now upgrade with latest Android 8.0 system. If you are a customer from DVDGPSNav, not only you will get awesome pre-sales service, but also excellent after-sales service. For any questions before you place an order or while installing, you can feel free to contact us. Rest assured about our service, and you can check reviews from our customers. Latest Android 8.0 system, with Octa-Core 32GB+4GB RAM optional. Shows BMW logo at startup, so it looks like original OEM unit and perfectly fits your car. A 6m long power cable will be sent to you for free if your car has a wide screen from original radio. A free 8GB original SD card with Android navigation maps for your country is included. Lifttime maps update is also free from DVDGPSNav.com. 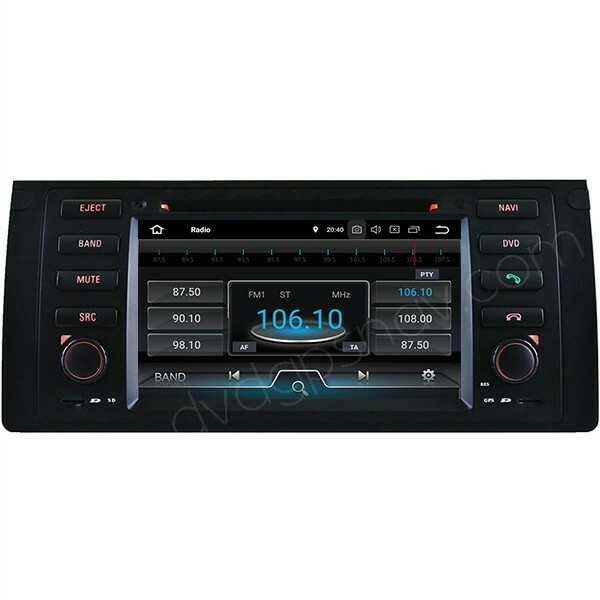 If your BMW E53 X5 just comes with business CD and car radio(not with a 7" or 4.3" screen in the dash) and non DSP amplifier, installation is very easy, you will not need to modify wires whiling installing. 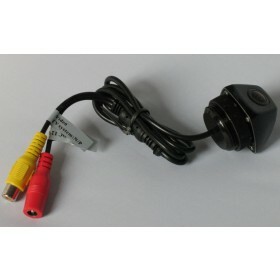 However, if your car has DSP amplifier and without a large screen in the dash, our unit does not support your DSP amplifier, you will need to splice our 8 speaker wires to connect your 8 speaker wires for each car door speaker directly to get sound. You will need to use our 6m long cable with both 17 round pins and 40 flat pins connectors to connect your 17 pins or 40 pins plug under the trunk. This Android E53 navigation can support your DSP amplifier(if your car has it) with 98% possibilities according to our experience before. You can run the long cable under the carpet along the door frames, remove the back seat to get access to the trunk, and hid the wires behind the cover panel in the trunk. DVDGPSNAV will send you this long cable for free. User manual can be seen in apps > instructions, it has already copied into the internal memory of this BMW X5 E53 Android radio head unit. You can also download the user manual here. A: Thanks for your interest, please take a dash photo from your 2006 BMW X5 for us to check(our email sales@dvdgpsnav.com), please also confirm if your car has DSP amplifier, so that we can tell you installation details for your car. Q: WILL YOUR UNIT REPLACE Factory installed Navi in a 2006 BMW X5. My screen is dead and im looking for a direct replacement. 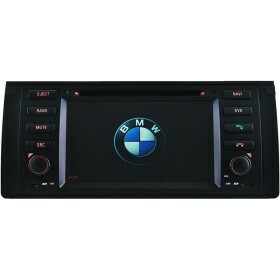 A: This is a direct replacement for BMW X5 radio, it replaces the factory radio/cd screen unit for installation. Q: I have a 2005 BMW X5 4.4i, it only has the narrow tuner/stereo interface, with the CD player above that, seperate, with a flip-up luxury wood cover. Will I have to remove both the tuner, the CD player, and the wood cover for this to fit? Will it fit?